The new concept is designed to be chartered all year round. The Hawk Ranger, as it has been named, represents “viable investment opportunities” and is intended for use as a “profit making enterprise”, according to Hawk. Capable of withstanding a 52-week charter season, the concept would be able to “dramatically reduce costs for build management and servicing”. 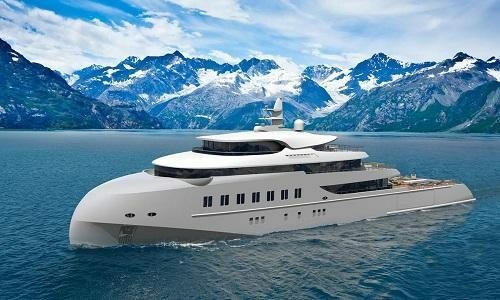 The Hawk Ranger will be able to accommodate 12 guests, and she will boast a top speed of 17 knots. At 12 knots, she will enjoy a cruising range of up to 6,500 nautical miles. Further details of the new concept are due to be shared in the coming months. The news of Hawk’s latest concept arrives after the announcement of two other explorer yachts in January – the 5-metre Cape Hawk and the 75-metre Sky Hawk. Falmouth Harbour Marina is a purpose-built superyacht marina in Antigua, developed with big berths and a deep draft to accommodate megayachts up to 100m/330ft LOA.